AUSTIN TRANSIT AUTHORITY IS JOHN SZOT (GUITAR), MITCH CLARK (BASS), AND KEVIN MCMULLAN (DRUMS). 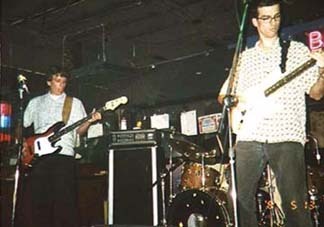 ATA HAVE BEEN PLAYING THEIR OWN VERSION OF SURF/ROCKABILLY INSTRUMENTAL MUSIC IN THE AUSTIN AREA SINCE 1995. THEY SEE THEIR MUSIC AS THE BACKDROP FOR SOCIAL OCCASIONS, ATTEMPTING TO MIX A RHYTHMICALLY-DRIVEN SET WITH THE MELODIC AND TEXTURAL SENSIBILITIES WHICH MADE INSTRUMENTAL MUSIC SO POPULAR IN THE '50'S AND '60'S.